INVERSE (part 2) video info. What is an "INVERSE" video? If you're new to this video series, check out INVERSE part 1 – I've included an explanation on that page. But if you've already started, INVERSE involves looking at another player's (the Hero's) hand history and trying to figure out their thought process and reasons behind the decisions they make. Hand planning – Determining what kind of pot size and bet sizes put us in to optimal situations as the hand develops. Bet sizing – Making the most profitable bet sizes on any given betting round. Pot geometry – Betting with the intent to create optimal pot sizes for the class of hand we hold. Almost all the hand histories in this video include mistakes in one or more of these areas, which results in missed value when holding a strong hand. SplitSuit highlights where these mistakes take place and explains how and why bigger bet sizes in certain spots can have a hugely positive influence on your winrate. 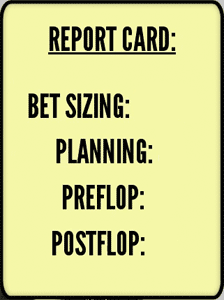 SplitSuit's report card for the Hero. (0:54) Hand 1 – AJ on BTN. Hit TPTK on flop heads up vs SB. (5:07) Hand 2 - AK in 3-way pot, hit TPTK on flop. 3flush on turn. (8:59) Hand 3 - Flatting with AK preflop instead of 3betting. Hit TPTK on flop. (12:07) Hand 4 - Set mining with 66 preflop. Flop is QQ6 in 4-way pot. (15:20) Hand 5 - Steal from BTN with KK. SB calls, we raise on 874r flop.